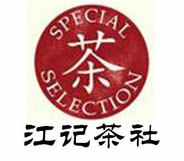 White peony tea, one variety of the white teas, is one of the top ten most well-known teas of China. 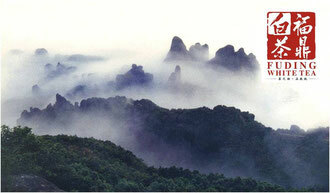 Fuding County of Fujian Province is the hometown of white peony tea. 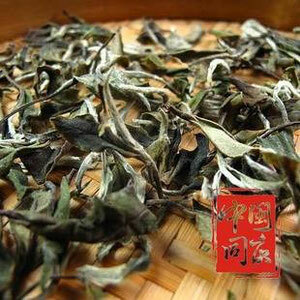 The tea leaves, with white downy hair, look like white peony flowers. The tea has two leaves, with a bud in the middle. They are tender, bulging like waves, and white downy hairs are covered all over the back. After being infused, the green leaves set off the tender buds, which looks like the blooming of the peony, graceful and elegant. 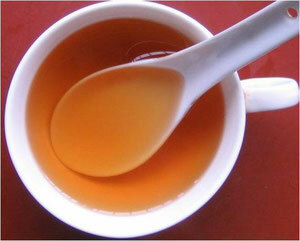 The liquor is clear and takes on apricot-yellow color, and the taste is mellow and fresh. White Peony, known locally as Pai Mu Tan, is a delicate tea made from tea buds collected and withered prior to opening. The latest medical findings suggest that white tea may be a more effective cancer fighter than even green tea. These findings have brought white teas to a much wider audience. If you are beginning your exploration of white tea, our 'White A' Cappella' tea will serve a wonderful introduction. Legend has it that the tea tree was turned from peony trees. 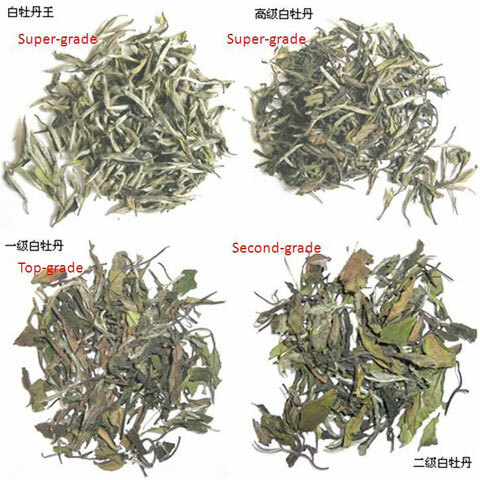 Same as silver tip white tea white peony tea is mainly producted at Fuding and Zhenghe areas in Fujian province. White peony tea is also a delicious white tea that consists of buds and leaves picked from great white tea plant in the early spring,sometimes blended with buds and leaves plucked from daffodil plant. The silvery bud is enfolded by green leaves, and it looks like a flower. When steeped,the green leaves unfold resembling petals of a peony blossom. That just as a inchoately blooming white peony, hence the tea is named "white peony tea". 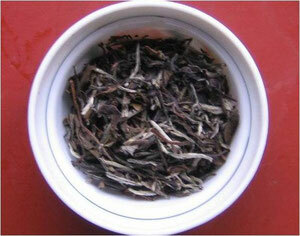 White peony tea is naturally fresh in aroma,light yellow or orange yellow in color,refreshing and mellow in taste. •Start with a well rinsed kettle (glass kettles for best results) and natural spring water, or well filtered water (non distilled). Avoid using regular tap water since the impurities will result in an altered tasting brew. And depending where you reside, these chemicals can be greater in numbers. •Let boil for two or three minutes and then settle for about a minute. Avoid pouring boiling water on the delicate white tea leaves for it will burn them and kill the taste. •Make sure your infuser is large enough for the leaves to fully open and steep. 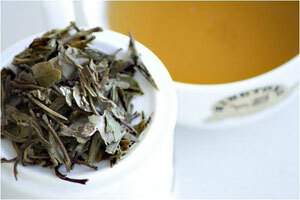 Add a little more leaves as well (about 2 teaspoons per cup) since white tea is lighter in taste. •Let steep for the instructed time your white tea came with. If you do not have steeping directions, a good indicator is as follows: brew White Peony tea and other varieties; 4 to 6 minutes should do the trick depending on desired strength, but no longer than that. Remember that over-steeping tea can result in a bitter cup! •Do Not add milk! White tea is meant to be enjoyed straight up. That is what it's known for...a natural and delicate taste. Adding milk is unheard of and will surely ruin the experience. Honey is fine if you want to sweeten it up a bit. •Also avoid using artificial sweeteners when you brew white tea for this too will alter the taste. 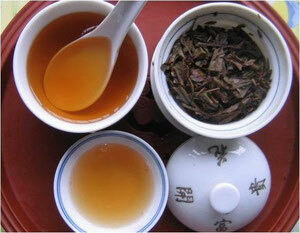 White Peony tea health benefits are similar to those of other white teas. White tea contains more polyphenols than green or black tea, which gives it more antioxidant power. The benefits of white tea haven't been as well studied as those of green tea, but, according to some research, white tea has more anti-bacterial and anti-viral benefits than other tea types.